Why Did You Decide to Run in Paris? How Many Days Were You in Paris? Was It Your First Time in Paris? Did You Feel Safe in Paris? Besides the Marathon, What Did You Like Best? On today’s Join Us in France, running the Paris marathon with Calee Spinney. This is Join Us in France episode 155, bonjour, I’m Annie, and today I bring you a conversation with Calee Spinney who ran the Paris marathon in 2017 and comes with a lot of tips for anybody who is thinking about doing it; and shares some of the things that she wishes she had known it before she went. 1’ Our next Paris tour is scheduled for October 1 through October 7, 2017. We would love to have you join us in France not only through the podcast but also in real life. All you need to reserve is a small deposit, and you need to visit AddictedToFrance.com, the sister site to Join Us in France to find out all the details. For show notes on this episode, go to joinusinfrance.com/155. And stick around until after the interview for my thanks to donors and also my personal updates. 1’38 Hello Calee and Welcome to Join Us in France! Calee: Hi, Annie, how are you? Annie: I’m well, how are you? Annie: I’m very excited to be talking to you today about running the Paris marathon. First of all I have to congratulate you, because I can’t imagine running any marathon whatsoever, so, wow! Do you do that often? Calee: No, it was only my second one and I think it might actually be my last. It takes up a lot of time to train, and it kind of makes me hate running. Annie: yeah yeah. Okay so, so tell us how the Paris marathon went for you and why you decided to run it, and maybe a little bit later on all the things you wish you knew before you went. 2’30 Calee: So, I really really enjoyed it. I thought it went very smoothly. Most of the things were as you would expect if you’ve run a race before. I decided to do it honestly, because I had already had my trip to Paris planned; and then I happened to see that the day of the race felt during my trip. And I thought, well if I’m there and I’m not running it, I’m going to be mad about it. You know, so I thought, I might as well even though, I mean, I only found out about it in January. So, I didn’t really have time to train like I would have normally, but I figured if it’s happening, if there is a race in Paris while I’m there, I have to do it. Annie: Just jumped right in, that’s cool! Yeah because the Paris marathon is in May, right? Or is it late April? Calee: the marathon was April 9 this year. Annie: Ah, ah, okay sorry. Calee: if you want to run the half marathon, that takes place in March. So, I kind of wish I had been around in March, because that’s more my style, but it worked out fine. Annie: And so, you didn’t have any trouble signing up for it. They were still spots and everything? Calee: yes absolutely, and I think that they were still advertising it for quite a while after that, so I think that even if you come across in a month or two before that I think that people could have signed up. Annie: Oh, that’s cool. Were there a lot of participants? Calee: Yeah, it’s kind of an interesting race because I think that a lot of the other international races you have to qualify for. But there is no qualification for the Paris marathon. So I heard that 60,000 people sign-up but actually only 50,000 people started the race. So I don’t know what that’s about, I don’t know people just decide not to travel. Or they couldn’t train. Cause I don’t know what the normal attrition is for an American race. So, that kind of surprised me. And I did hear when I was at the Expo to pick up might be able, I heard people around me say that they didn’t realize that you have to have a medical form to run, so I think that some people may be miss out because of that. Annie: Ah, you absolutely have to have a medical form. You want to explain that? Calee: Yeah, there’s just the… And it’s a really basic medical form you can download it from the marathon website. And you just have to go to a doctor to say that you are healthy enough to run. So it’s pretty basic. I think the doctor puts in their name and their address and if you use the one that they provide, the use all the terminology that they need to have on it. And it just says this person is healthy enough to engage in running competitions. Annie: Right. And this is a French thing actually. To do any sports in France, any organized sport, you need to show up with a medical certificate. And depending on how strenuous the event is, your doctor will be adjusting what they ask of you. Sometimes they ask you to do jumping jacks and then take your blood pressure before and after and take your pulse and see if you recuperate fast enough and that sort of thing. That’s a very French thing, and don’t try to run the Paris marathon without it because you won’t get in. Calee: Yes, that was the first step at the Expo. If you have your medical form, you didn’t go anywhere past that. 6’ So, is it a pretty race to run? Is it all over Paris? Calee: Yes, if you look at a map of Paris that started at the Arc de Triomphe and ran the map it down into the right see you run to the Château de Vincennes and then you cut back around any kind of almost run on the same angle all the way up to the foundation, the Louis Vuiton foundation and then you come back and the finish is almost exactly where you started, so it’s in the area of the Arc de Triomphe again. Annie: That’s cool, were there lots of people cheering you on? Annie: were there bands and things like that? Calee: yeah, there were a lot of drumming groups there which are really cool because you don’t you know you are relying on someone being a good singer or not. And yeah, and people had some really fun signs on the sideline, it was good. 7’52 Annie: Did you feel it was well organized that you got all the information you needed ahead of time? Calee: Yeah, I mean, there was a little bit of guesswork, but at the same point I really felt it was going to work out. All the email that came were in both French and English so it easy to figure out what was going on. Everyone at the Expo itself really knew what they were talking about, so, I did have a couple of questions about gear check and things like that. Because there is security around to checking your gear has gotten tighter, but they were able to answer my questions without a problem. Annie: Right, so how does it work? I mean what you’ve signed up you pay your dues you have to go get your number now, right? On the day of, or the day before? Calee: The days before. So, the Expo was open Thursday, Friday, and Saturday. It was out, I forgot the name of it, le stade something. Annie: at a stadium, okay. Calee: Yeah I’m sorry I can’t remember the name of it, but it was not anywhere near the start or the finish or anything like that. And they always have something like that where they’ll have the section where you pick up your number and whatnot; and then I have just tons and tons of companies associated with running whether it be running clothes or fueling or things that you might want or whatever, and the race shirts you might want to buy. There’s a huge section setup so you can walk through and, you know, spend your money! Calee: But when you go in to pick up your bib, it’s very clear you go in and you give your medical form if you have that, and they stamp this other form that you had to print out that kind of gives your bib number and whatnot and then you go to one section and they check your number, and they give you a packet that has your race number on it whatnot. Calee: And then, you were able to sign up for a couple other things along the way like some folks did like you can buy tickets a pasta dinner, so you can get tickets to that, or the breakfast run, they had like a 5K for the race, you would pick up your things associated with. So it was kind of in a big semicircle, you picked up the things that you had paid for. 10’17 Annie: So the pasta dinner was the day before I suppose? Calee: yeah I didn’t sign up to do that because I figured I would buy able to get a nicer pasta dinner somewhere else. But, that’s a fairly common thing, it was the evening before the race, I’m not sure what they held that. Annie: So, there’s a there’s a bunch of extras that you can sign up for? Calee: Absolutely and they are very reasonably priced. I did the breakfast on the day before the the race, and it was like 8€ and included a T-shirt so I felt like, yeah, very very reasonable. I also purchased the metal personalization which was 5€ and is it just a little stick on piece that will go on the back of your metal with your finish time. I just got in the mail the other week, so it takes a little while to come but it was also coming to the US. Annie: I suppose there are professional photographers along the route? Calee: Yeah oh yeah, of course, they always do that. Yeah, it had all the amenities that you would expect and I honestly like all of those add-ons would’ve been much more expensive in the United States. Annie: Ah, okay, so you didn’t feel like it was a rip off? You know, buy the picture and buy this other thing. Obviously, at 8€ for the breakfast that’s, I mean, a hotel breakfast is between 12€ and 16€ or something, and that’s not even an expensive hotel breakfast, that’s the average price, and if you get a T-shirt on top of that, well that’s not bad. Calee: Yeah, and I just thought it was really nice that they gave everyone running it their country flag, and everyone brought their country flags to the run, so it was just really fun to see where people were from, and people were getting together to take pictures and get they were from the same country, or mixing up different countries. I just thought it was a really fun thing, and we ran through the Louvre area and whatnot and there were tons of tourists taking pictures of us at that point because it was it was probably a couple hundred people, you know and it clearly wasn’t a whole race as there were a lot tourists just snapping pictures of the crazy people running on the cobblestone. 12’37 Annie: Yeah, the cobblestone, was that hard on you on your body? Calee: It was tricky, I did see a couple people fall, so I felt bad for them, I hope they didn’t hurt themselves too much. I, of course, told myself I would run a couple of mornings right after I got there, but it’s really difficult to do that right after you cross the ocean. So it’s a nice way to guarantee that you at least got out once before the race and got out to see things a little bit, make sure your body was still functioning the way it was supposed to! 12’50 Annie: So what do you wish you knew before you before you went? Things that surprised you maybe besides the medical certificate because that’s clearly something that you have to do. Calee: One thing that I would want to talk about is that, so, there was a start area and then if you wanted to check your bag it was a pretty far walk back to the area where you did the bag check. Because obviously for security they only wanted one way in and one way out. So, it was it was like a full metro stop. I got off when all the other people got off even though I knew it wasn’t the closest place. Cause I took the Metro to the to the start. I would say probably at least a third of a mile that we were all walking back, and we were walking past the places that we knew the bags would be stored, but we had to walk to the far end. I was by myself, so it really wasn’t a problem, but they really only let the runners in. So if you were just a friend, they would not let you in to the gear check area at all. You had to go in and then come back out and then you could meet up with your friend again. Annie: Well, yeah, that’s safety I guess. Calee: Yeah, absolutely, and it wasn’t something that I was surprised to see, I mean is I’ve run lots of big races in the US too, and you just kind of have to figure out what their system is, and just go along with it. Because they have to, especially after the thing that have happened, you know that they’re doing it for your own safety too. Calee: Another thing is, I just want to say, it was very well organized with the different water and snacks that they had along the route. Especially like I said, it was a very warm day for us. Just tons of water for us to drink, and they would have buckets of water set up on the side of the road, so if you wanted to put some water on your head or on your shirt or in your hat, you didn’t have to take the drinking water to do that. Yeah, so that was really good, and even from the 5K mark, they had oranges and pretzels and things like that for people to fill with. Normally in American races they only have one or two spots were there giving out actual food. Annie: They give you a little sugar boost that’s good. Calee: Absolutely, and again, there was plenty of it as well. Like I said, it was a warm day but I’ve never seen so many people just lying on the side of the road before. Just before the end, people were laying on the side of the road, being stretched out by their friends, being fanned by their friends, I was like, oh my goodness! Annie: How hot was it? Calee: It was like 75°F which is in the 20s I believe. Annie: 75°F is probably 24 or 25 Celsius. Annie: but it you are running, it is! 16’15 Calee: And there wasn’t a lot of shade, I think that was the biggest problem is that there wasn’t a lot of shade, so it was difficult to try to regulate your own temperature. American races tend to start at like 7 o’clock in the morning. And with the way that they started things, I am sure the elite runners started at 7 in the morning, but for the rest of us they had at set intervals of like every 30 minutes or something. So I didn’t start my race until after 9 o’clock. So yeah, so if you’re calculating the time for the mortals that are running, I didn’t finish until one or two o’clock in the afternoon, and it was pretty warm by then. 17’08 Annie: All right, what else? Calee: The other thing is that you do get a finishing shirt, and it was like that kind of a silly thing, but it was pretty clear from everything that I got ahead of time or at the Expo that I was going to get a finisher shirt. So you do. So, if you want to save a little money at the Expo, you can just wait for the finisher shirt which is pretty nice. I guess that was a difference. Like an American races tend to advertise their finisher shirts. Like, they will advertise the design ahead of time, and they didn’t mention it at all. Annie: So you maybe were a little bit surprised that that you got it in the end. Calee: Yeah I was kind of expecting it, but at the same time I was like, well, who am I to know? So it wouldn’t have been necessarily surprising if they didn’t have it. Annie: So that’s a different shirt from the one that came with the breakfast? 18’04 Annie: You were in Paris for how many days total? Calee: I was there for two weeks. Annie: Oh, wow, that’s a long time! Calee: Yeah I was really nice. I tend to get jet-lagged pretty badly so I feel like if I’m going to cross an ocean, I need to stay somewhere for at least 10 days. The race was a week after I arrived so I did have a good amount of time to acclimate to the new time. So it was good and bad because at the same time I felt we had to be careful about what I ate before I ran. Annie: Yes, which is not easy! Calee: Right, I wanted to try to not walk as much in the days before hand. So, it was a blessing and a curse in some ways. So I think the people we just need to think about how their own body reacts when they travel. Plan to arrive however much beforehand that they find would make sense. 19’ Annie: Because you know in Paris, and this is something I experienced with the tour that we did, people who have a set ideas about what they want to eat or want to eat healthy in other words, it is a little bit difficult. It’s not impossible but your choices are going to be limited. If you want a healthy choice, well, you’re going to get salads or you’re going to get fish pretty much. 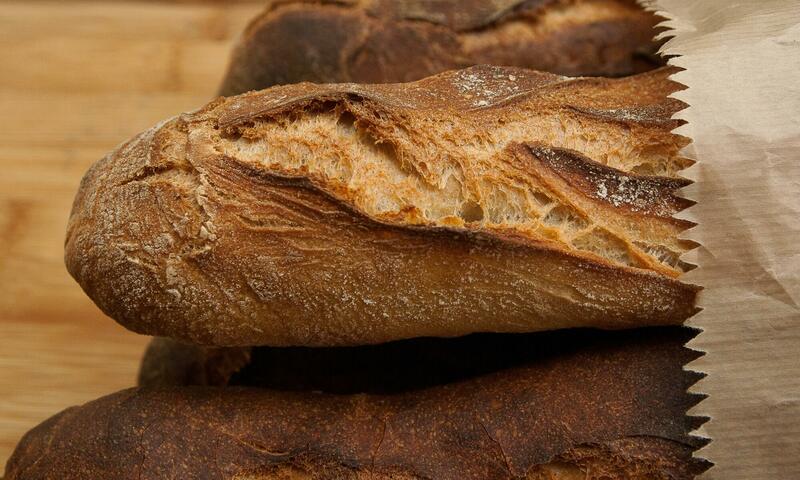 Because, in people in French people’s minds, if you’re a health nut, that’s what you eat. And if you’re everybody else, well, you eat lots of duck and beef and pork and things like that, which are never you know super healthy because they are a lot of calories. And maybe you don’t want to put on weight right before a race or something, I don’t know, I’ve never done any races of any sort but I suppose that’s something you would want to watch probably? So, keep that in mind: on vacation you’re not going to be eating super healthy unless you really try. Calee: Right, one thing to note is that normally lactose intolerant in the US but I was actually fine eating all the dairy in France. Calee: So I’ve heard that before, some people who can’t tolerate gluten in North America are fine eating bread in Europe. And I don’t know if that’s different processing or different bacteria in the food. For me, I was going to eat any of the things regardless, but I brought Lactaid with me and I didn’t take any of it. My body felt fine the entire time. Calee: If someone is going to get very ill, I would not recommend that they try it, but if you just have a little bit of a problem, give it a try when you’re there, you might be surprised. Annie: we do have very good no milk products, the yogurt, the creams and all that, are pretty good. I mean honestly! Calee: You know, I I had a very good time eating all the things. 21’ Annie: So, was this your first time in Paris, or you had been before? Calee: I had been before, but it was a very quick tip when I was in college we my marching band went over there and we played like a parade over there in Monaco and stuff. Yeah, it was really cool, and especially for a bunch of college kids. You know we were just on the top of the world. But in Paris I think we just spent two days. You know, I remembered visiting Notre Dame or Le Louvre before, but I didn’t have any really solid memories because I was just checking off boxes. But this time I really got to go and really enjoyed it. Annie: So, did you stay at a hotel or was it an air B&B? Calee: We stayed at an air B&B that was right by Rue Mouffetard. Yes, it was wonderful we were right on a metro line, so we used that quite a bit. We got the Navigo Semaine card. Annie: So that’s the weekly bus and metro card. Calee: Yes, and we used that a lot, we really got our money’s worth. When you have like that like you don’t worry about jumping on for just a stop or two. Annie: Yes, I think that’s the one thing that’s really good about having the weekly pass is that you don’t count your trips you just take, you know, the transportation when you need it. Calee: Yeah, so we really got to know the metro system is what we mostly use, but we also took a few buses, we were in a great location, there were tons of cafés a bistros nearby. We were a mile from Notre Dame, so it was great. 23’13 Annie: Did you feel safe? Calee: Oh yeah, I mean, there were, I mean we saw the gendarmes around quite a bit. They were walking the streets in groups of four all the time. But I felt very safe. I kind of went in that little window between the Orly attack and the the attack on the Champs Elysées, but yeah, I felt fine the entire time. I never felt like I shouldn’t be here, these people this or that. Yeah, there was security around, but I honestly saw that as a good thing. If something happened, there’s someone nearby to take care of it. Annie: And unfortunately things can happen anywhere. So long as you are not personally feeling threatened and freaked out, that’s a different matter, but you know if you’re the kind of person who thinks I’ll just be smart about what I do, but you can’t live under a rock! Calee: Right, I mean, I live in the San Francisco area so just like if you think about someone coming around like anywhere I go to potentially be all a target. So I felt very good about the whole thing, I really felt like they know what they were doing and they were on alert, so that’s the best you can do. 24’32 Annie: so did you have a favorite restaurant or favorite the activity that you did besides the marathon, obviously? Calee: Yeah, I can’t remember the name of the neighborhood but there were two restaurant that we went to that were across the street from each other, one was Chez Fernand, and then across the street I think it was called La Boussole. And they were both not touristy places all, we had actually had escargot at both locations, I had boeuf bourgignon at one location and lamb tajine at La Boussole, which isn’t very French but was incredibly delicious. Annie: Oh yeah that’s really good, tajine is really good. Calee: Yes it was a cute little neighborhood, I think it’s an expensive neighborhood, that’s why everything was very cute. There weren’t a lot of tourists around. Most of the people around us seemed to be French, so yeah. Calee: It had the red checked tablecloth on the table, so it was, at least very much appeared to be a neighborhood sort of place. 26’ Annie: And did you have a favorite activity? Calee: That’s going to sound weird, but Palais Garnier was wonderful. It was a little bit unexpected I think because it was right in the middle of the city and it looks pretty from the outside, but you almost don’t really expect everything inside. Calee: This is going to sound strange, but we met this French guy on the train back from Versaille, and he took us to Giverny the next week-end. And that was gorgeous, that wasn’t something that I thought we were to be able to do our trip, but I am so happy that we were able to go there! I was so happy that we were to go there, I could not have imagined how gorgeous. Annie: That is a very friendly person! Calee: He was so kind, he works as an engineer at Renault, ever know and something had happened to the train, I think it had hit someone so there was no trains leaving for an hour. And he was like, I’m going to walk to the other station, if you want to come with me. And he literally lived, he was going to same Metro stop we were… He lived very close to where we were staying. So while we were in town, he joined us for dinner at Chez Fernand. And we went out to Giverny together. He was just great. All of the things that you hear French people don’t want to talk about, like politics and money and things like that, he wanted to hear a young person’s perspective from America. It was really great, we had a really great time. Annie: It sounds like you made a friend! Calee: Absolutely, so he might end up coming to America, he’s taking a sabbatical from work, so we might get to show him things over here too. People say French people aren’t friendly, but they absolutely are. Annie: no, they are friendly it’s just how you approach them. They don’t like the move over I’m coming kind of person. But if you are polite and kind and say “bonjour” it usually works out very very well. But it sounds like this guy was extra friendly. I mean, having dinner with you, I’m assuming he wasn’t flirting with you. I don’t know, maybe he was? Calee: I don’t think so, maybe he was. Late one day after we had dinner you know we went out to see the Eiffel Tower sparkle, there is some other folks lost and he was helping them figure out how to navigate the train system. Annie: maybe that’s just the way it is. Calee: Yeah, he loves Paris; he loves the history. Annie: Was he your age or older? Calee: I am 36, I think he was late 20s. Yes, I think he just wants people to experience Paris in a positive way. Annie: Ah, very cool, extra points for Renault! I don’t like their cars, but he sounds like a nice person. All right, anything else you want to tell us about before we say goodbye? Calee: Ah, I don’t think so honestly, any experience you have an opportunity to take advantage of, I say do it. I don’t regret any single thing that I did, even if it meant staying up late or getting up early. Annie: Well, excellent. Thank you so much for coming on the show to share your experience with the Paris marathon and good luck for other races that you may run the future. I you signed up for another one soon? Annie: Yes, life happens! Thank you so much Calee! Au revoir ! 30’12 My thanks to Dannie Hanke who signed up to support the show on Patreon this week, you’re patron #60 Dennis, thank you very much for stepping and helping the show continue. And thank you to the all the patrons who support the show month after month, I want you to know how much I appreciate your continued support. To support the show on Patreon, go to patreon.com/joinus And to support the show in some other way go to joinusinfrance.com/support. Thanks for reviewing the show on iTunes Denny 2016 from United States who rates the show 5 stars and says Great information! And fun too! And also to Bbuechel from United States Fun, quirky and informative podcasts about visiting France, they also say “On the podcasts with both Annie and Elise, the two discuss, debate and interrupt each other in a way that is so endearing you wish you could join them in person.” I wish I could meet more of you in person and maybe someday I will on a tour  There was also a review from Ab0312 from United States who rates the show 5 stars and says Delightful! Lots of episodes about a variety of topics for those interested in France. 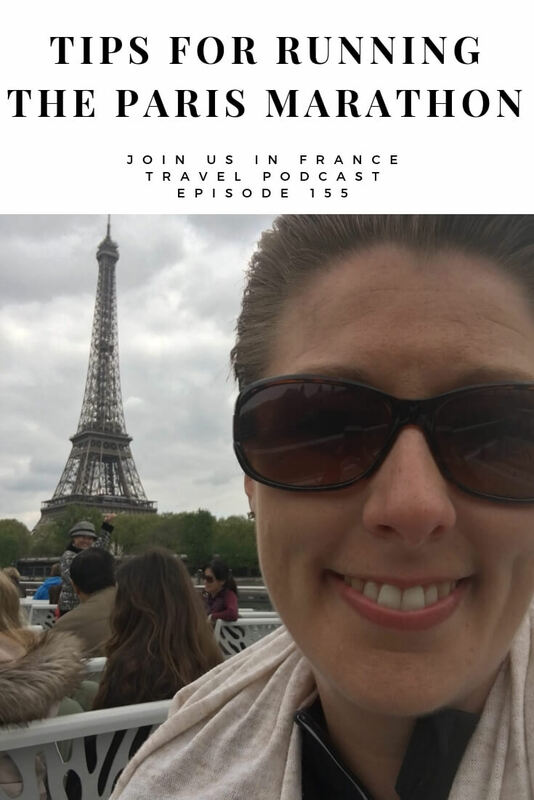 I have never been, but am learning the language and hoping to go soon, so I enjoy “prepping” with this podcast and opening my ears to things about France that I could never learn just by pursuing google or trip advisor. Lots of tips for your upcoming Parisian vacation! Annie is warm, knowledgeable and honest about experiences, places and adventures in France. I love her interviews with those who’ve visited the country. She really has created a sense of community through the podcast and then with the closed Facebook group that accompanies it. I enjoy any time I get to listen to an episode. Merci, Annie! You are going to make me blush 😉 Thank you for taking the time to review the show! You know what else you can do to help the show? Share episodes on Facebook! Your friends need to find out about it from you because I’m useless at marketing! I also want to thank all the people who get in touch with me to offer to record an episode with me about their experience in France. If we’ve discussed recording an episode together in the past and I got too busy and dropped the ball, please ping me again, I want to hear from you! 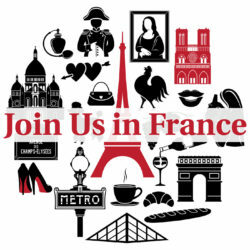 connect with me either on the Join Us in France Closed Group on Facebook or email me annie@joinusinfrance.com, or leave me a voice mail 1-801-806-1015. In a personal update, I just spend a wonderful few days in areas of the Dordogne with my friend Brenda. It’s such a wonderful part of France! I’ll record some episodes about it with Brenda and you’ll hear all about it soon. In the meantime, I’ve added two hotels to the list of hotels I recommend, and you can see that on joinusinfrance.com/hotels. We had an early heat wave in France this June, temperatures hit 105 degrees F (40.5 C) which I probably don’t have to tell you feels awful. It’s so hard to keep going all day visiting this and that when it’s so hot! For those of you coming to visit this summer, I cannot emphasize strongly enough to make sure you choose a hotel that has AC because no matter what they say, when it’s that hot, even the thick walls of a chateau will not protect you from the heat all that well. And if the hotel has both AC and a pool, even better! And when you are planning your trip, keep in mind that you’ll need to make the most of cooler morning hours to do anything that has to happen outdoors, and save afternoon hours to go to the pool, or canoe, or visit the inside of a cave or visit large museums that always run AC. I found that a lot of cafés and restaurants in the Dordogne didn’t have AC which meant that sometimes it was more comfortable to grab a sandwich and eat it in the car with the engine running. We also found it hard to buy ice at grocery stores. I talked to several clerks about this and they said we get more ice when it gets hot. To which I joked, is it going to get hotter than 105 F??? Surely not. The reality is that the Dordogne is still a place where there is a definite tourist season, and that’s July and August. The rest of the time, French habits of no AC and no ice prevail. I hope they get the message and change that soon.